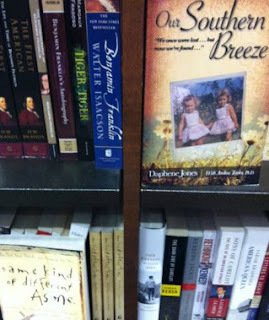 Regan Hall, my niece took a picture of OSB next to SKODAM today in one of the Dallas Barnes & Noble stores! This is so exciting. You can see it in Dallas, Ft. Worth, Austin, and Atlanta! Thank you for supporting this amazing journey I am on! Writing my story, Our Southern Breeze, was an adventure from day one. After I was asked to do it because so many people want to know more about my twin sister, Debra Hall, I gathered up the journals, notes, photos, and memorabilia that I had saved and I began. I spent a year reworking what I had and ended up creating a 227-page journal. I next put together a 25-page (single-spaced) timeline of my life, and emailed it off to a woman I had never met face-to-face. It should have been a scary moment for me . . . but it wasn’t. Andrea Taylor, who lives in Frisco, Texas, and I, who live in Atlanta, Georgia, had been talking and emailing for several weeks, and I just knew in my heart that she was the one who could actually get this done for me. Although a published author and the owner of a custom publishing company, Andrea had never ghostwritten for anyone. She was a little nervous about committing to do it because of that, and I was a little nervous about committing to pay her for doing it because I didn’t actually have the money to do it. So we both took steps of faith and began a most fascinating journey together to bring my story to readers everywhere. Andrea’s task was to take my journal, which was a rich source of material for the project, the timeline, my brother-in-law’s original manuscript called Denver Bound, and his New York Times bestseller called Same Kind of Different As Me (Ron Hall with Lynn Vincent, 2006), and craft a story that would capture the hearts of the readers as they experienced my life right along with me. We agreed to write my story as creative non-fiction, using all the elements of novel writing such as setting, characters, dialogue, and story line. She set different tones depending on what was happening in my life, and she tried to capture my voice in both dialogue with other characters and in my thought life. After she wrote each new chapter and emailed it off to me, we got on the phone and talked through the details, discussing additional memories I had. Then she would go back to that chapter, sit down at her computer, and pour out my heart through her words. She placed herself in my shoes as best she could and felt my pain enough to get it out onto the paper, crying and laughing and praying her way through the manuscript. Andrea reminded me many times throughout this year-long process that our goal was never perfection. Our goal was excellence for His glory. When we found errors, we corrected them. She took artistic license and purposefully broke some of the rules of writing in order to bring authenticity to my story and better connect with the reader’s hearts. If Our Southern Breeze brings hope and healing to God’s people, either through the written word or through my speaking opportunities, then Andrea and I have done a Good thing. We both pray that it is so. 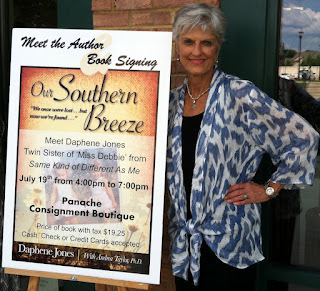 Last night I had a book signing at Panache Consignment Boutique in Suwanee, GA. Many of my friends and shoppers came and we had a wonderful time. Lemonade and cookies were served. Yesterday I attended my first meeting with a networking group called Georgia Commerce Club. What a wonderful opportunity to meet new people who have businesses we all could benefit from. Click this link for more information. Thanks Pamela for inviting me. Soon to be Texas Bound! I am getting excited about my upcoming trip to Texas in September. Check out my updated calendar at OurSouthernBreeze.com to see if I'll be in your area. 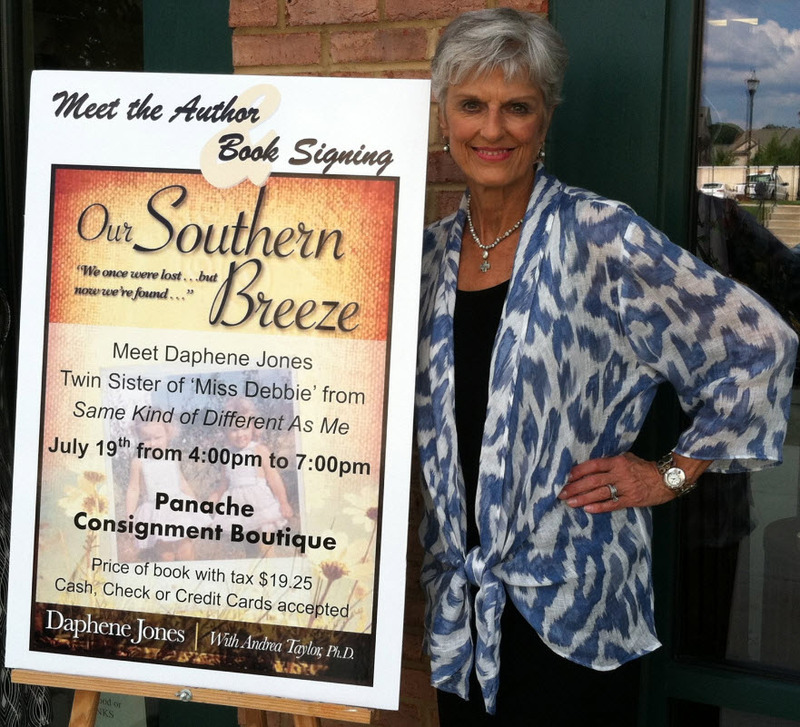 I am having a book signing at Panache Consignment Boutique in Suwanee, Georgia on July 19th. It is from 4 p.m. to 7 p.m. Please come out if you are in the area! Big News with Barnes and Noble! This has got to be a GOD thing! Several weeks ago when we had sold 1,040 books and not in any book stores, I decided to be brave and see if Barnes & Noble would talk with me. I knew they had our eBook and paperback on the website for a couple of days. When I started calling different stores in DFW, Atlanta, and Austin all of the managers said they couldn’t order it. For you who know me, that wasn’t the answer I wanted. Andrea Taylor, who wrote with me and set up our distributor, emailed me the name of the VP of Sales/Buyer in Manhattan I should call as she thought it could at least be sold on the website. NO ONE ever answers the phone but Jane Love did!! I introduced myself and told her about OSB and my connection to SKODAM and Ron. As we were speaking she said she was sending an email to the man who decides and buys all of the books for biographies and if I didn’t hear from him I was to call. Edward called this morning and we had an amazing conversation on the phone. Before we finished talking, you would have thought I was in line with the “big boys”! I told him I would like to have my book in DFW, Austin, and Atlanta. I promised him that I would let my energies be directed to B & N and knew that I was riding in on Ron’s coattails!!!!! He just laughed but know he thinks the same thing. After talking with Edward I now have my first B & N book signing scheduled for September 5th between 6p and 8p in the Ft. Worth B & N at University Park Village! I asked the young man in Ft. Worth how many books I would have to sell to get Edward notice me. He said anything between 45 to 50! Please join me in asking God for that number! Sweet Regan asked for 5 books so she can start marketing to her church and friends. Other friends of Deborah’s are also helping me! If you know anyone even near DFW, by Monday I will have the poster ready and can send a pdf version of it if you feel it might help spread the news. I’m also going to call the FT Star Telegram to see if they will do an article. I am overwhelmed at God’s grace and abilities to have this happen to a West Texas girl named Daffny Snort, a snior from Sider who stopped learning in the 7th grade!!!!!! Thank you to my dear friends who never stopped believing in me!